As more and more of our lives revolve around our smartphones, we really do need their batteries to last as long as possible. With those phones receiving more beefy CPUs and larger screens with more pixels, they’re starting to use more juice than ever before. Unfortunately batteries aren’t seeing huge improvements in technology, which as a result has left manufacturers with only one option: put larger batteries into their handsets. Which is why, when Samsung said that the Galaxy S5’s battery was of the 2,800 mAh variety, people got worried. Its predecessor, the Galaxy S4, had a battery rated at 2,600 mAh, so of course the extra power being used by the more powerful innards of the new device had some concerned that the slightly larger battery simply wouldn’t be able to cope. In fact, it was such a concern that two different sources went out and conducted some battery life tests, comparing the Galaxy S5 with a host of other high-end smartphones and tablets. 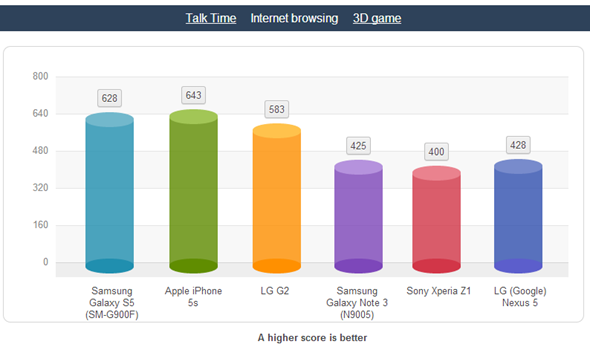 The results, thankfully, make for good reading if you’re looking into picking up Samsung’s next big thing, the Galaxy S5. 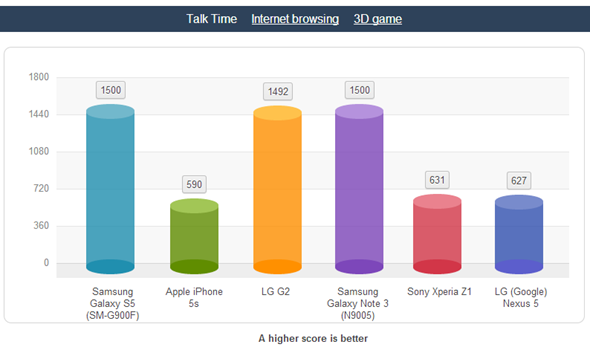 In fact, not only did the Galaxy S5 manage to hold its own, it actually managed to achieve better numbers than some devices with larger batteries. As an example, the S5 lasted between 7 to 10 hours of screen time, depending on the brightness of the display, when being used to browse the Web. 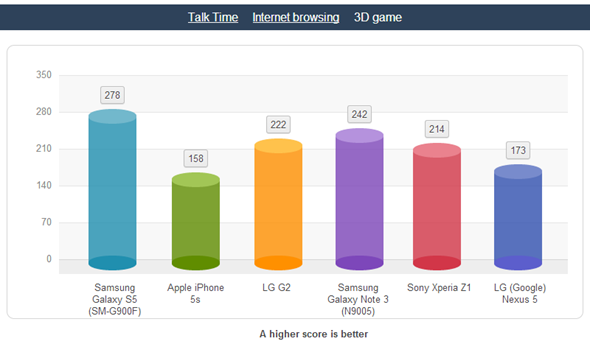 3D gaming saw the Galaxy S5 do particularly well, with no other smartphone on test being able to last as long as the new device from Samsung. In fact, it went on for nearly double the time that the iPhone 5s managed, a true case in point that a larger screen means you can have a larger battery sat behind it. Of course, battery life isn’t all that’s needed for a new smartphone to be well received, but it’s certainly not going to hurt. 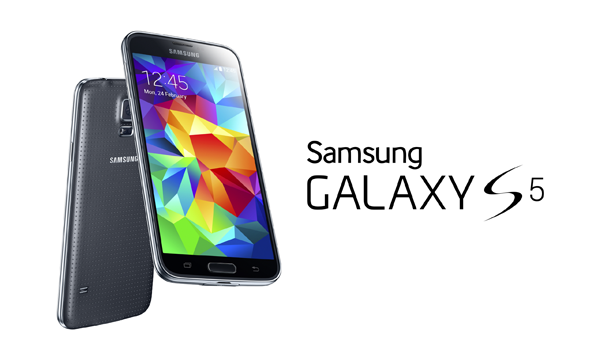 No matter the stats though, we’re sure the Galaxy S5 will sell exceptionally well, just as its predecessors have. It goes on sale worldwide very soon, so those looking forward to getting their hands on the potential new king of Android won’t have to wait too much longer. And they won’t have to worry about their battery life too much, either.